Or even how to do one? AND be able to download your very own competitor analysis template down below. Let’s start with the basics - what is a competitive analysis? It's exactly how it sounds - it’s analysis of your competitors! ...and understanding the strengths and weaknesses of your competition (or even potential competition) is SUPER important to the success of your business. And that’s where the competitive analysis comes into play. AND helps you find new customers. Said another way - conducting a competitor analysis is crucial to how you decide to operate your entire business. Let’s get the *official* competitive analysis definition (for the sake of thoroughness). Let’s jump into how to do a competitor analysis! Performing a competitive analysis (while it might seem daunting at first), isn’t that complicated. And to prove it - I’ve broken down how to do a competitive analysis in THREE (yes, just three) easy steps. Seems obvious - but first, you need to identify your competitors. All you really need to do is perform a simple Google search of the products / services YOUR business offers, and make a list of companies that also show up in the Google search. 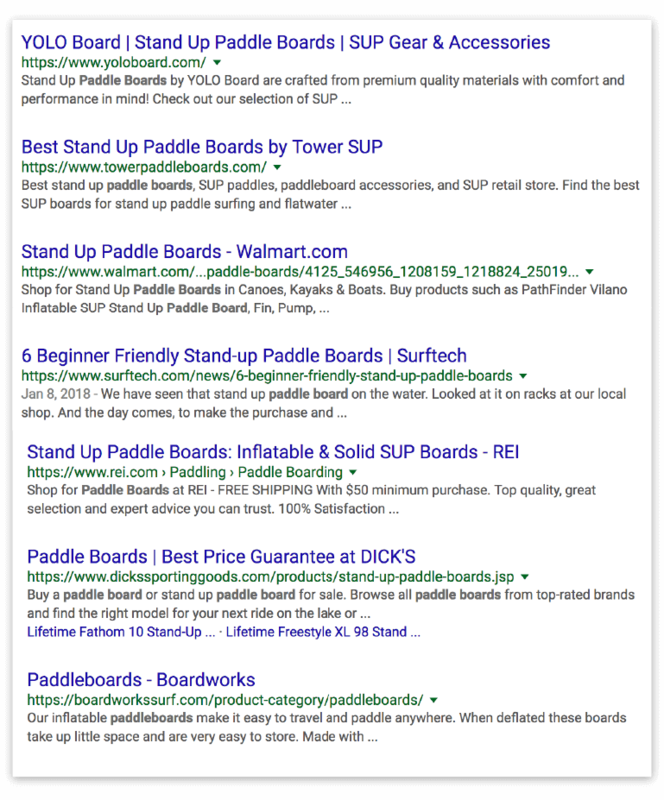 For example, if you sell paddle boards, you would type “paddle boards” into the Google search, and then review the results, and compile a list of companies who also sell paddle boards. One thing to note here - you also need to be realistic about who your actual competitors are. If you’re a small business owner with a local brick-and-mortar retail store that sells trendy women’s clothing, your competition is not the men’s retail store across the street (even though they are also selling clothing). The competition you should really focus on would be another women’s clothing store who is literally selling the exact same product as you. They are the ones who will have the largest impact on your success. If you’re a 10-person marketing agency in Sioux Falls, South Dakota, your direct competition is other similar sized marketing agencies in the area - not Ogilvy (a major advertising agency) in New York City. And once you feel confident about your pool of competitors, it’s on to the next step! After you’ve identified who your direct competitors are, it’s time to research them! To be honest, this is the hardest step in the process, mostly because it can be rather time consuming. But, it's also is the MOST important step. Because the data you collect here will directly impact the outcome of your analysis. The first phase of the research should be focused on the business of your competitors. How are they priced compared to you? Are they just an online retailer? Brick-and-mortar only? Or a combination? What is included in their product line? 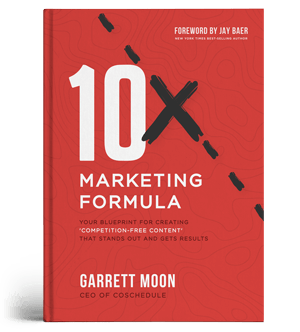 Next - you need to figure out why a customer would go with you versus your competitors. The *best* way to really get a feel for this is by surveying new / current customers AND implementing a survey for former customers. (Note: it’s not easy for all businesses to collect information from former customers, especially if you’re in retail. BUT if you are able to get info from former customers (which is much easier if you have clients or run a subscription service where they literally have to cancel their membership to stop paying) this is a HUGE opportunity to gather critical information). What other business were you considering before you picked us? What do we have that our competitors did not have? Is there anything you wished we did have that our competitors do have? Why do you no longer use / work with / go to our business for X product/ service? What would have kept you from leaving our business? Do you now use / work with / go to one of our competitors? If so, why did you choose them over us? Finally, you need to dig into their marketing strategy and comb nearly every aspect of their website (and how they rank with similar keywords)...and do a clean sweep over their social presence. What are they doing with their marketing content? 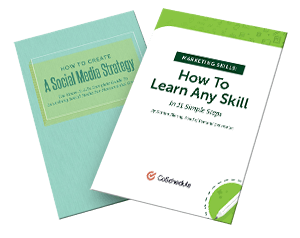 What are there overall strategies when it comes to demand generation, PR / social media, and product marketing? How many followers do they have on all the social networks? And once you’ve collected all that^ data…. You’re onto the final step! The last step (and IMO - the fun part) is to compare yourself with your competitors! The best way to do this is by performing a SWOT analysis for each competitor, which helps you identify your own strengths and weaknesses, and in turn, identify your future opportunities and threats (this is where the term SWOT comes from). Once you’re done, you will have a clear picture of how you stack up against your competitors, and have all the information you need to decide what changes need to be made to optimize your business. Now that you’ve gotten the scoop on how to do a competitive analysis, let’s jump into a competitive analysis example. ...Isle Surf and SUP - a (you guessed it) surfboard and paddle board retailer. For the sake of not overcomplicating this example, we are going to focus solely on their paddle board competitors. First, let’s see what Google brings up for us and we can evaluate from there (for best results, search for your competitors product or service in Incognito mode). Listed below are the search results (psa: for the sake of example, I removed a few annoying ads that were in the way 🙄). ^Looking at the above list, the competitors that Isle Surf and SUP should focus on are YOLO Boards, Tower, Boardworks, Walmart, REI, and DICKs. Even though Isle Surf and SUP is a much smaller retailer, they are selling the *same* product - paddle boards - as Walmart, REI, and DICKs. 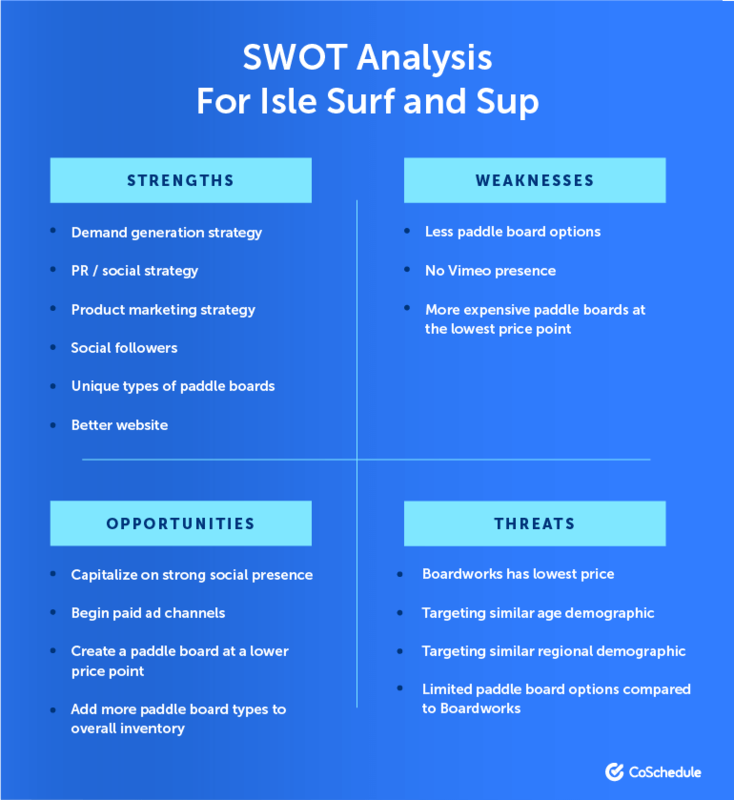 So Isle Surf and SUP should also include them in their competitor analysis. ...it’s time to move onto the next step! Pick one of the listed competitors, and start researchin’! For the sake of the example, we are going to research just one of the listed competitors (Boardworks), and then you would just repeat the same process for each competitor. 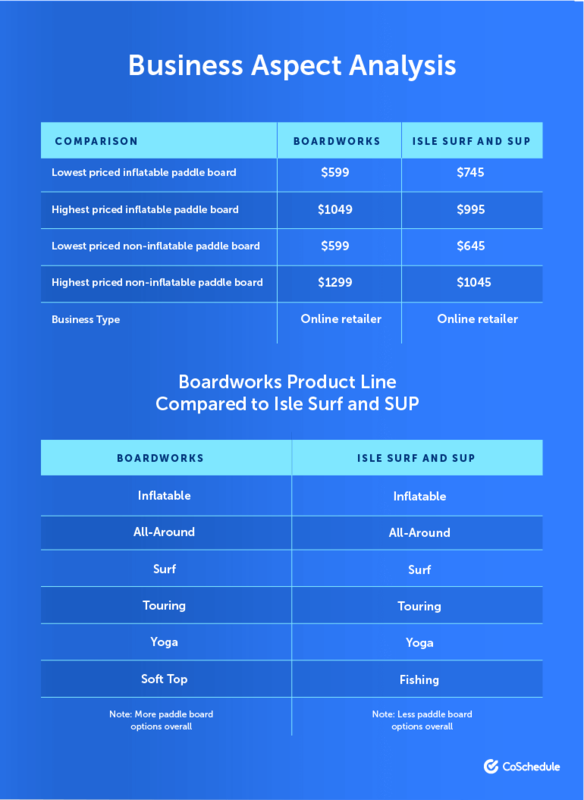 How does Boardworks pricing model compare to Isle Surf and SUP? What type of retailer is Boardworks compared to Isle Surf and SUP? What is included in Boardworks product line compared to Isle Surf and SUP? Next, we need to figure out why a customer would go with Isle Surf and SUP versus Boardworks (and vice versa). 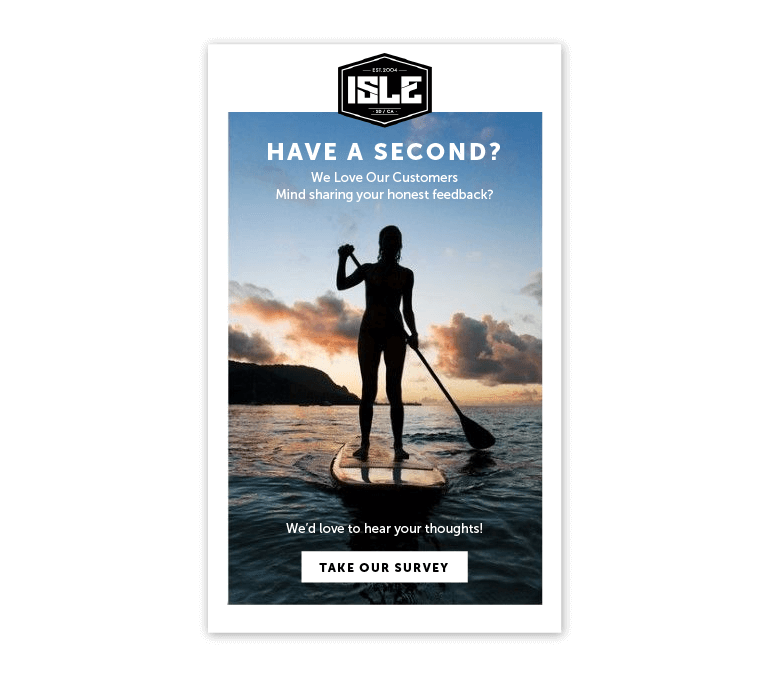 The best way to execute this portion of the competitor analysis (and would provide them with information on all their competitors) would be for Isle Surf and SUP to create a survey they could email to new / current customers - or in this case, someone who has just bought a paddle board. They could easily include a link to the survey in an email thanking the customer for their purchase (separate from the order confirmation). A key to a great survey? Use a mix of open-ended and multiple choice questions. 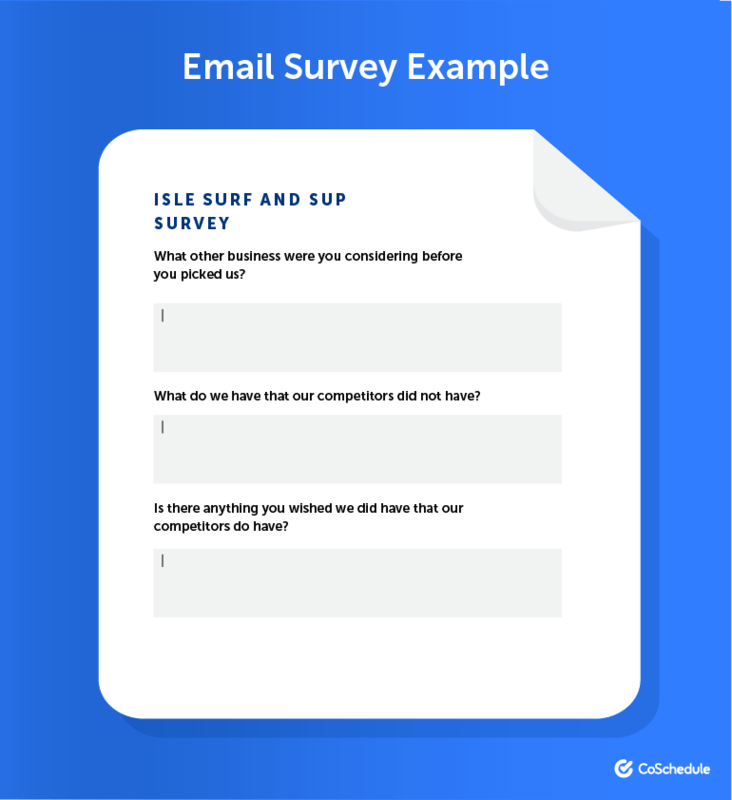 This ensures you get the answers you need, plus long-form answers written by customers (which are great for Isle Surf and SUPs marketing team to use when they are writing marketing copy). Finally, let’s get all the marketing deets we can on Boardworks. What is Boardworks doing with their marketing content? 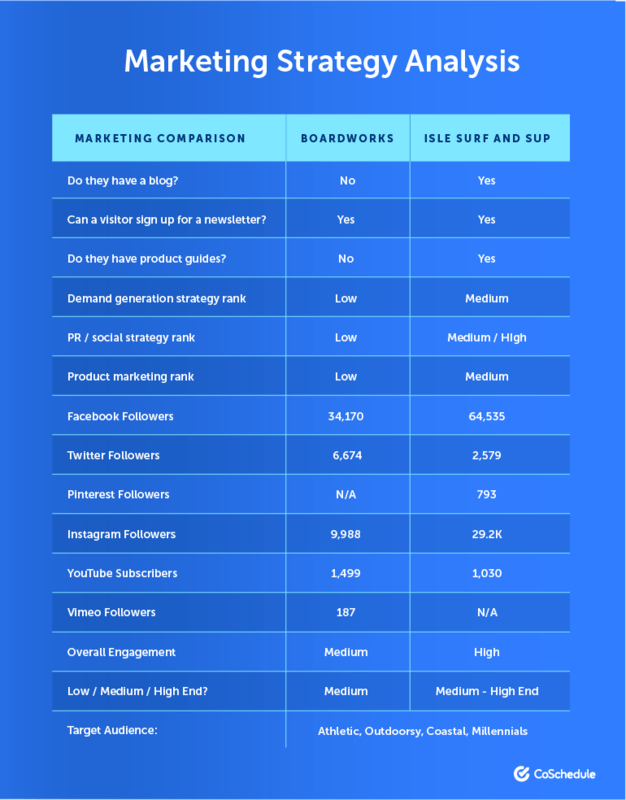 What are there overall strategies when it comes to demand generation, PR / social media, and product marketing for Boardworks? Who is Boardwork’s target audience? How are they positioning themselves in the market? AKA...time to perform the SWOT analysis! So in this case, it looks like Isle Surf and SUP should capitalize on their main strengths, their website and overall marketing strategy, since both are far superior from Boardworks’...but it also looks like (based on their threats) that they should consider making adjustments on pricing and potentially their target demographic (depending on their overall market strategy) - or Boardworks might be able to close the gap on market share. They would have a clear picture of how they stack up against their competitors, and have all the information they need to decide what changes need to be made to optimize their business. Their entire competitor analysis would be complete! Get your *exclusive* competitive analysis template here. 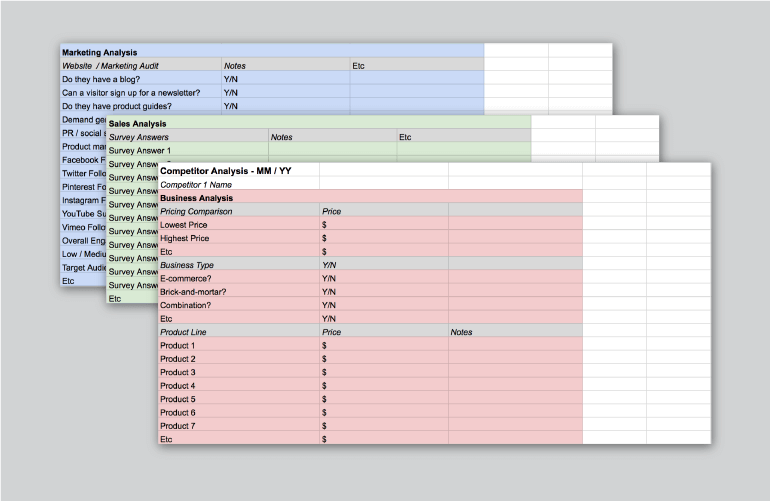 AND you have your very own competitor analysis template.